A private inner-city laneway recently became a place of transformation, converted into a lively and community focused event space in the heart of Tauranga’s CBD. A design competition organised by the NZ Institute of Architects, showcased the Tauranga Design and Arts community coming together to create a temporary installation for the NZIA Festival of Architecture and Tauranga’s Groundswell Festival of Innovation. The laneway design competition was won by two local design firms, Beca Design Practice and RM Landscapes. Both winning entries featured concepts questioning how laneways can revitalise and contribute to Tauranga’s urban identity. 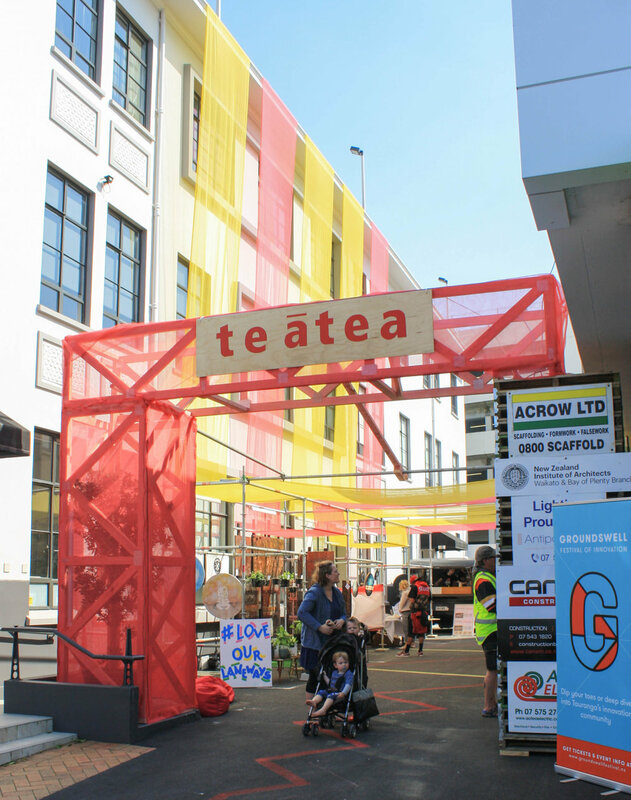 The final laneway concept, a collaboration between the two firms, centred on the idea of Te Atea – a common place, where everyone is welcome. It was to be a collaborative and creative space where people could gather, interact, exchange goods and share kai. An important outcome of the Love our Laneway event was to encourage and grow community support and participation in Tauranga. A feature of both winning designs was for the Laneway to engage with the surrounding city centre context. This was achieved by visually extending the installations above the surrounding building facades and to extend the ground treatments out of the site extents. Creating a strong sense of arrival was also an important consideration and a series of portals were created to break the laneway into distinct rooms or spaces. The design further reduced the width and verticality of the laneway by draping large ribbons of fabric down the building, weaving it through temporary scaffolding to create a more intimate scale. The entry portal area opened into a linear gallery space, where local artwork was displayed, and people could occupy the small booths contained within the scaffolding to sell and promote their business. The laneway design competition was won by two local design firms, Beca Design Practice and RM Landscapes. Moving through the laneway, the scale of the space opened up to a seating area, stage and performance area where visitors could sit and absorb the live music and food on offer or just make the most of the warmth of the afternoon sun. Creative Bay of Plenty, which supports arts and culture in the community, coordinated the programming of the space, which ranged from yoga to pingpong and salsa dancing with live music , and both temporary and permanent art installations adding colour to the surrounding buildings. The permanent artworks will be a legacy and reminder of the event and giving presence to an otherwise unknown inner-city laneway. By night, the area remained active hosting events coinciding with the Festival of Architecture, including the screening of Citizen Jane, Battle for the City. Projections were also cast on some of the blank facades of buildings nearby. A feature of both winning designs was for the Laneway to engage with the surrounding city centre context. An important outcome of the Love our Laneway event was to encourage and grow community support and participation in Tauranga CBD in particular over the weekends. Other longer term urban installations such as ‘Our Place’, have added some critical mass to attracting residents and visitors back in to the central city. The social interaction that was created in the Laneway between the general public, shop owners, tourists, musicians, artists and the wider design community over three short days highlighted the value of such events and experimental spaces within the city. Creating a strong sense of arrival was also an important consideration and a series of portals were created to break the laneway into distinct rooms or spaces.